Are you hunting for the best Tulum wedding venues for your Tulum wedding? Do you think that getting married in a private beachfront villa might be a better fit for you than the typical Mexico all-inclusive wedding? Well, I think you’re on the right track. I work in the Riviera Maya weddings industry and knowing what I know now if my husband Marc and I were newly engaged, I would 100% look at private wedding villas to host my destination wedding. Gosh, I’m so glad you asked. Here is why you should consider a private villa for your Tulum wedding instead of getting married in an all-inclusive resort. Do you want to plan a beach wedding that is as one-of-a-kind as you are? The best way to make that happen is to rent a private villa. When your Tulum wedding venue is a private villa, you are not limited to typical Mexican wedding packages. This means you can truly create the wedding of your dreams with your choice of flowers, food, or photography style. The world is your oyster! Rent a Tulum private wedding villa, and watch your Pinterest board come to life! Personally, I never wanted a hundred strangers in bathing suits watching me get married on the beach. I think a destination wedding should be a private affair shared with a group of people you love, not an open audience of whoever happens to be lounging on a beach chair nearby. All beaches in Mexico are public property, so there is no guarantee against curious bystanders for any Tulum wedding. On the other hand, the nice thing about private villa weddings is that they are located on quiet beaches in gated communities with secure access. Compare that to the Riviera Maya all-inclusive resorts with thousands of guests, nestled between other all-inclusive resorts with thousands of guests. Check out Hacienda del Mar on Tripadvisor! Will you host 10 wedding guests or 110 wedding guests at your Mexico destination wedding? 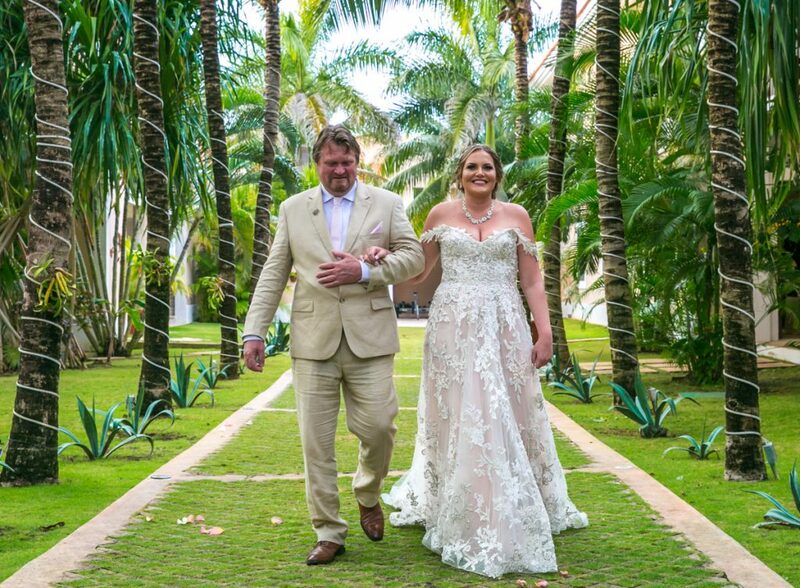 You can rent a private Riviera Maya villa to suit any size of guest list you want, which is wonderful because when it comes to destination weddings, one size does not fit all. For that reason, choose a space that feels appropriate in size for the number of friends and family you will celebrate with. This creates a feeling of intimacy with your loved ones….and keeps the Groomsmen from wandering off to find a t.v. playing the big game, something that is hard to control in a big all-inclusive resort. Because little hiccups are bound to happen at your Tulum wedding, that’s just the nature of weddings! But when it comes to your Big Day, the last thing you want to worry about is TIME! So rent a Tulum private wedding villa, and you eliminate the panic. Shuffle the timeline if you want because everyone is there for YOU and only YOU. Therefore, if you want to relax and enjoy another glass of champagne ‘getting ready’ with your bridesmaids, then do it! No need to rush your special day. Kayla & Logan’s wedding was thankfully at a private villa since Mother Nature didn’t cooperate! You don’t have to go home, but you can’t stay here! This is the message you will hear at 10 pm (or 11 pm if you are lucky) at all-inclusive resorts in Mexico. There is a time limit on noise in common areas because, after all, you can’t impede on someone else’s vacation even if it’s your wedding day. While a huge pro of renting a private wedding villa is that the rules are much more relaxed. Let the tequila flow, and keep the dance floor rocking until the wee hours of the morning. Midnight or 1 am are pretty typical wrap times for a private event at a Riviera Maya villa. And why shouldn’t you squeeze as much fun out of your wedding day as you can? Check out Villa La Joya weddings! Get the BEST wedding photos in Tulum! Do you hope for tons of beautiful, unique and creative wedding photos to tell the story of your wedding day? First, the timeline is relaxed, so the Bride and Groom are relaxed. This always makes for looking terrific in your wedding photos! Second, we do not worry about shooting around sunbathers or keeping Looky-Loos out of your pictures. Resort-goers don’t intend to mess up your wedding photos, but in so many ways, they can. Third, villas offer interesting landscaping, pathways, staircases, doorframes, palapas…you name it! We get the opportunity to be creative and make magical images! Therefore, get the most amazing wedding photography by renting a Riviera Maya villa! So, how do you find private villas that double as Tulum wedding venues? Search for the best Riviera Maya villas to rent and send inquiries to the ones you love. Often the owners and managers will recommend a wedding planner they trust to help you take it from there. Likewise, you can message us, and we will point you in the right direction. We work with the best in the biz, and are always happy to help! Message us here. Let’s hear it. Will you choose a private villa for your Tulum wedding? Tell me the biggest reason for your decision! Please share your comments with me below. Finally, are you hunting for the best Tulum wedding photographer for your private villa wedding? Then contact us now! We are Fun In The Sun Weddings, for the best wedding photography in Riviera Maya, Mexico. The venue you choose to have your ceremony at plays a massive role in such a memorable day. I also prefer a private villa over an all-inclusive resort. Hello Gillian, the blog you had shared shows the great aspect while considering a private villa for the Tulum wedding instead of getting married in an all-inclusive resort. Keep posting. Hello Gillian what is a cost of a wedding for a private villa with 40 or 45 people as guests ?.I just got engaged and I was thinking about getting marry at Dreams Playa Mujeres but I read your article and I want to know all the pros and cons.Are you a wedding photographer and do you have wedding packages ? Very interested in a Villa wedding over a resort. But, need a little more info before doing so! Please email me! We love villa weddings! You can reach us via email at Info@FunInTheSunWeddings.com OR jump on the live chat on our website.